I was looking for a small pumpkin pattern. 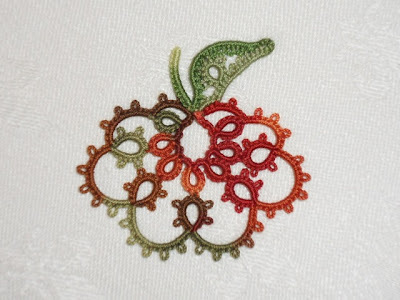 Doodled for a while thinking I'd come up with my own... then I happened upon Mark Myers' Apple pattern... and thought it might look good as a pumpkin! I'm waiting for some plain orange colours. the new threads in a day or two. So this is Autumn Spice again. Another of my favourite Lizbeth colour ways. This nice pattern is quick to tat, just what I was looking for. I particularly like the way he made the leaf. It has interesting curves in it, using the small ring inside to pull the curves in. I'm also knitting away and have now started on the second pattern repeat. Love the pumpkin!! I must go tat it now ;) I am working on a knitted baby blanket right now so an easy quick tat would be fun!! Must say again that I love the pumpkin and in that color way too!!!!! We have here what is called the "Golden Apple Award" for special teachers. I have made Mark's apple in gold to give to a few of my favorite teachers. Good to see the pattern makes a great pumpkin, too. Way too cool pumpkin. I love it. Oh yes, please join in the knitting! It would be fun. The steeks are a bit scary at first but they are such a great design tool that I sometimes put them in even when they're not called for so I can keep knitting in the round! A kötés kicsit bonyolultabb! Szép hetet! Beautiful pattern great pumpkin and gorgeous colours. The sweater is looking great! I pulled my Alice Starmore books off the shelf. I think I may get inspired to knit over the Christmas break. Hello again. You'll have to knit slow so I can get caught up. I selected my yarn/colors and the pattern I'm going to use is Alice Starmore's Water-Lily Jacket. The goal that I have is to use what I have and not buy some more LOL. Should we start a KAL? KAL Ellen? Knitting something something? I'll go check out the Water-Lily jacket. KAL means "knit a long" like you would be the moderator, cause it's your site and we are following you, you are making your sweater, and we are making ours. Like knitters who are working on something "Alice Starmore" so we can all relate to her knitting style, colors, or how you do steeks, etc. ? Questions and problems - encouragements that we can all identify with. Does this make sense? You're using a Steek!!! - they terrify me. I like the Autumn Spice thread - your pumpkin colours match the wool perfectly! Oh no Maureen! Steeks are GREAT. They enable you to knit in the round and to make the whole sweater/cardigan in one go. That's got to be a good thing. Also it's faster to knit because you "knit" all the way, no purling (apart from in the ribbing). 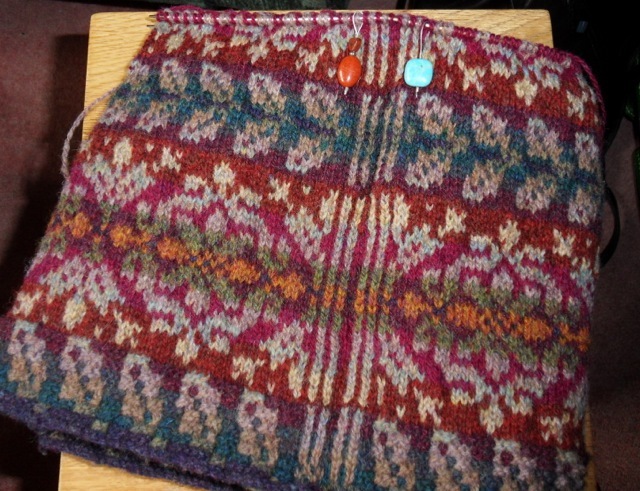 And you're right, I hadn't noticed that the middle band in the cardigan has got those pumpkin colours in it! I have happily run out of orange (it is not my favourite colour) and have no intention of ordering more, BUT I have a lovely autumn variegated Lizbeth with which I shall tat that pumpkin. Yours looks great - better than just plain orange, in my opinion. Thanks! What a beautiful pumpkin! I had planned to just work on the quatrain and not do any pumpkins (especially after the Celtic pumpkin distraction last year, BUT this is so lovely, I think I'm led astray! You temptress! And that knitting is gorgeous. I never tried a steak but one of my knitting friends assured me that it's one of the most rewarding feelings theres's in knitting! The pumpkin & the knitting are gorgeous! I'm a little 'late' with my comment, so you'll probably have that gorgeous sweater finished by now! The steek looks attractive, too! It's not the cutting but the finishing of the edges that would do me in! I have several of Alice's books but have never knit anything from them, except a teddy bear sweater from patterns in her Fair Isle book! I just love looking at the books and feel privileged to own them! You may recall I met her twice - she actually came to Pennsylvania and met with our knitting group back in the late '80s, early '90s. I'm amazed to read of her knitting adventures and her life since then! Meeting her seems so long ago now, when we were all younger! By the way, I have a photo of her holding the teddy bear! The photo is one of my prize possessions! That's the beauty of steeks again. Not that much finishing involved. First of all you don't need to weave the ends in (thank goodness!) but you can do a criss-cross stitch with matching wool after you've picked up the stitches and knitted the button bands so that keeps all the little ends neatly tucked in. 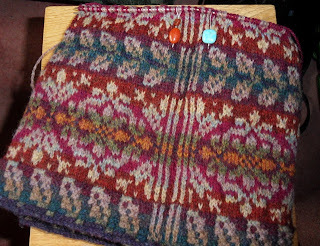 Eventually it all felts into the fabric of the cardigan. I envy you having had the chance to meet Alice Starmore! By the way, THANKS for this cute pumpkin idea! I just tatted it (with some variation) and posted it. Of course, I gave you (and Mark) credit! Yours is SO perfect, especially the leaf, which I didn't do - yet!